I love stir fried food. The vegetables stay crisp and colourful and the meat is tender and tasty. I also love pork and think its rich taste is really enhanced by sweet peppers. 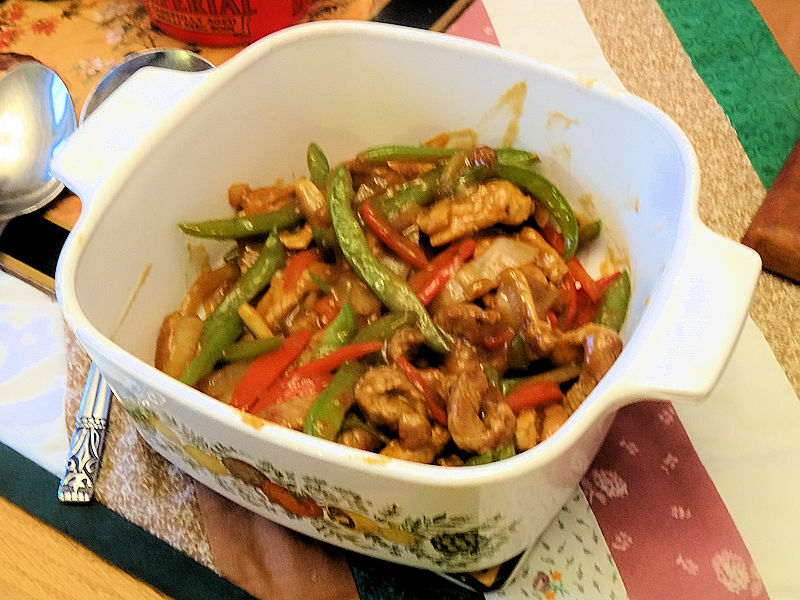 Obviously, I needed to make a Pork & Pepper Stir Fry! Stir fries are very easy if you take the time to prepare all the ingredients in advance. Go ahead, say mise en place. You know you want to. Mise en place is just a fancy culinary term for having everything prepared and ready to go. You can use this technique to make meal time quick and easy. Say you don’t have a lot of time between getting home from work and going out for an event. You can cut the meat, slice the vegetables, mix the sauce and mix the water and cornstarch in this recipe the night before. The next day, all you have to do is heat the wok up and cook the dish which will only take about 5 minutes. Way faster than buying fast food, better for you and way tastier. 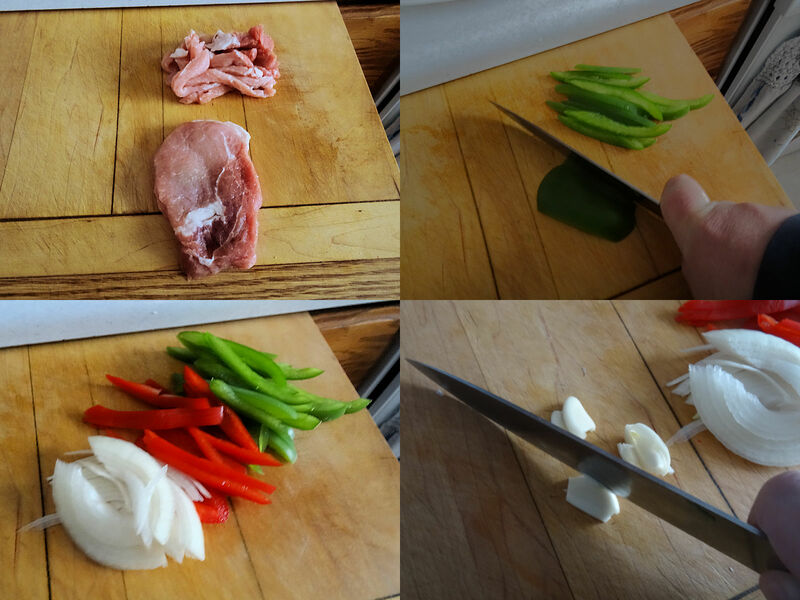 Start by cutting 375 grams (3/4 pound) of lean pork into thin slices. Finely chop 3 cloves of garlic and add it to the peppers and onion. In another container, mix 15 ml (1 tablespoon) cornstarch in 25 ml (2 tablespoons) cold water. This can all be made in advance and stored, covered, until ready to cook. Add 15 ml (1 tablespoon) oil to a wok or large frying pan. Heat over medium heat until the oil just shimmers and there are wisps of smoke. 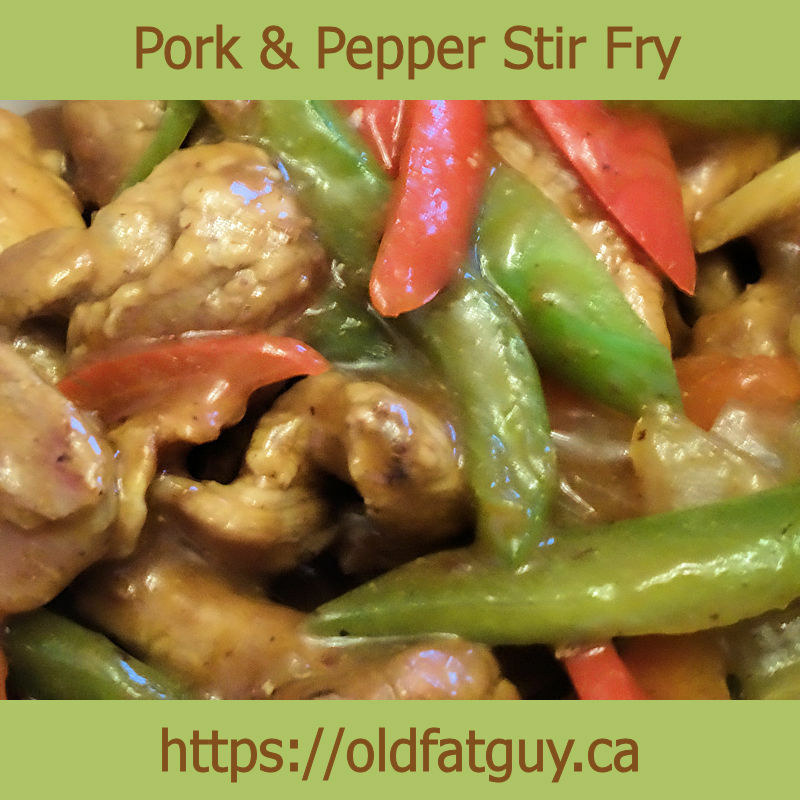 Add the pork and stir fry until cooked through 3 to 4 minutes. Add the vegetables and stir fry until they are just softening but still crisp, 2-3 minutes. Stir the sauce mixture and then pour it into the wok. Stir fry until the liquid begins to bubble. Stir the water/cornstarch mixture and then pour it into the wok. Stir fry until the sauce is thickened and glossy, about 1 minute. Put onto a serving platter. I love this. The pork has a great texture. The peppers are bright and crisp. The sauce makes a rich tasty glaze with just a touch of spice. Quick plus tasty plus easy equals a great meal! Put the vegetables in a bowl. Mix the chicken stock, soy, ginger, Sriracha, and ground pepper together. Mix the cold water and cornstarch together. Heat the oil in a wok or large frying pan over medium high heat until the oil is shimmering with wisps of smoke. Add the pork and stir fry until cooked through, 3 to 4 minutes. Add the vegetables and stir fry until just starting to soften but still crisp, 2 to 3 minutes. Stir the sauce mixture and add to the pork. Stir fry until starting to bubble. Stir the cornstarch mixture and add to the wok. Stir fry until the sauce is thick and shiny, about 1 minute. Remove from wok and serve. Looks tasty, thanks for sharing! David, what if we grill it instead of frying? just curious, never tried though. There are stir fry accessories for grills but they generally don’t really do it. Stir frying requires high heat and close contact between the wok or pan to quickly heat the vegetables tender/crisp. The longer time on a grill doesn’t give the same texture. I love stir fry! I will make it for sure. It looks delicious! Thanks so much, Arnaly! I hope you like it!